This is a stock image. What is a “core” or a “core charge"? A core is a term used in the automotive industry for the old defective engine in your vehicle. A core charge is a deposit left with us to ensure the core engine is returned. We pay the return shipping on the core engine. All core charges are refunded as soon as the old defective engine arrives at our location. This normally takes 2 – 3 business days. PLEASE READ AND UNDERSTAND: Engine warranties are limited to manufacturing defects in the block, heads, pistons, crankshafts, camshafts, rockers, and oil pumps. All other parts that may be provided are “Accessories and Extra Parts.” No warranty is provided for any such parts that are attached, including parts such as switches, sensors, cables, injectors, electronics, belts (including timing belt/chain), hoses, water pumps, manifolds and oil pans. Heat tabs are installed on engine if melted or missing Warrantee will be voided. Determine why the original engine failure occurred and make appropriate repairs. Insure this engine is the same application as the one being replaced. Clear all computer diagnostic codes from the vehicle prior to installing. Exchange the oil pan and pick up tube. Inspect and replace gaskets & seals (front seal, rear main seal, valve cover gaskets, oil pan gaskets). On crankshaft bolts that are drilled through sealant must be applied to avoid leaks. Install new thermostat & gasket. Remove all "cap-plugs" orifice covers. Install replacement sparkplugs & wires. Exchange the flywheel and bolts. Exchange attached accessory items to insure proper fit (mounts, intake manifold, exhaust manifold, distributor, sensors). Disable fuel/ignition before attempting to start engine. This will allow the oil to prime as indicated by the manufacturer. Replace engine oil, oil filter, air filter, fuel filters, coolant-antifreeze. Drain excess oil and coolant from exhaust system. If equipped with an engine oil cooler the radiator or external cooler must be replaced. Insure the cooling system is flushed and functioning properly. Heat tabs are installed on engine if melted or missing Warrantee will be voided. Warning! 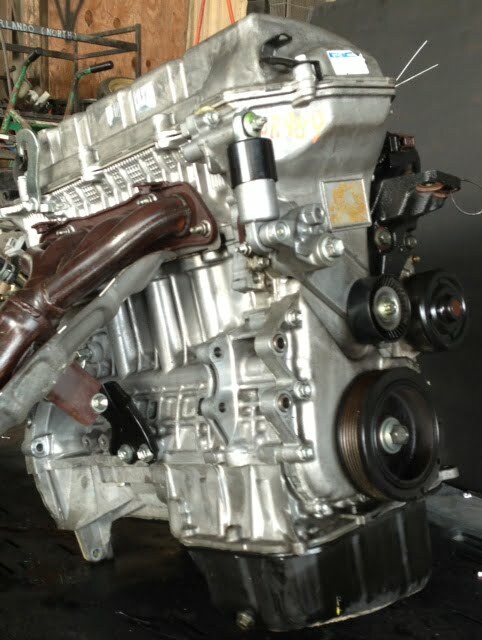 Incorrect removal and replacement of the harmonic balancer on a 2.3L engine will result in movement of the timing chain and cause bent valves. Watch the tutorial for more information. The video tutorial is located at the bottom of the Products & Installations page. Commercial Address WITH Forklift or Loading Dock – Price listed is for shipping to a commercial/business address with a forklift or loading dock designed for semi trucks. If you do not have a business address with a forklift or loading dock, we will ship this item to a freight terminal that is available closest to your shipping zip code (sometimes they are not close, so verify before purchasing). You must provide a day time phone number when you are checking out. Someone over 18 must be present for delivery. Daytime phone number is required (load will not deliver until appointment is scheduled). Cannot ship to AFO APO military addresses or P.O. Box. Cannot ship to APT. Number, we can ship to your apartment building (complex name is required).